CodeTwo Active Directory Photos is designed to let you easily upload photographs to Active Directory and then manage and edit them according to your needs. Even hundreds of employees' photos can be size-adjusted and added to both internal as well as outgoing company e-mails, appended to signatures and footers. Owing to this free application, bulk photo changes and uploads can be done with a few clicks and they do not require using Import-RecipientDataProperty cmdlet command. The user interface of CodeTwo Active Directory is clear and logical. In large organizations, photographs added to internal e-mails may be the best way to let employees recognize each other and to make their conversation more tangible and natural. 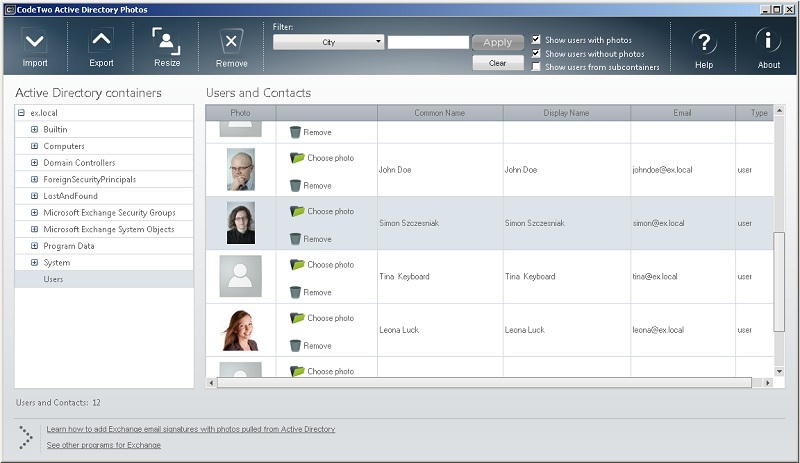 CodeTwo Active Directory enables adding pictures to internal Outlook 2010 messages and displaying them in GAL (Global Address List) and contacts. Photographs can also be included in external messages' signatures to allow clients to see who they are corresponding with. It may be a good idea then to create a unified, beautiful e-mail signature template for all employees. It would display appropriate photographs, ascribed to every staff member. Adding photos to multiple e-mail signatures is simple if you insert Active Directory (AD) placeholders to your e-mail template. This feature imports data from AD and automatically supplies the signatures with a suitable content - employees' photos in this case. You can activate this function using CodeTwo Exchange Rules Pro. It includes a user-friendly template editor, containing a wide list of applicable AD Dynamic Fields. Both CodeTwo Active Directory Photos and a trial version of CodeTwo Exchange Rules Pro can be downloaded from CodeTwo's website for free.